My name is James Maxlow and I am a retired professional geologist who has worked as a mining and exploration geologist throughout much of Australia. During that time I also returned to Curtin University of Technology in Perth, Western Australia, to study and research Expansion Tectonics. From this research, I gained a Master of Science Degree in 1995 followed by a PhD in 2002. I first became interested in Expansion Tectonicsduring the late 1970s when working in the Pilbara region of Western Australia. This is when I also came across and read the book “The Expanding Earth” by Professor Samuel Warren Carey, Emeritus Professor of Geology at the University of Tasmania. The Pilbara is a huge ancient domal structure dating back to around 2,500 million years ago. The Pilbara domal structure is many hundreds of kilometres across, where chemically deposited iron and silica-rich sedimentary rocks form the largest deposits of iron-ore in the world. It occurred to me that this relatively undisturbed domal structure may represent a preserved fragment of a much smaller radius ancient Earth existing at that time. As part of my ongoing research into Expansion Tectonics, I used modern seafloor and continental geological mapping to create a series of 24 scale models of the ancient Earth. These “small Earth” models were then used to display the seafloor and supercontinental plate assemblages of the ancient Earth, extending from primordial Archaean times—some 4,000 million years ago—through to the present-day plus one model projected to 5 million years into the future. An extensive array of modern geological, geographical, geophysical, and biogeographical information was also used to quantify the small Earth modelling studies. 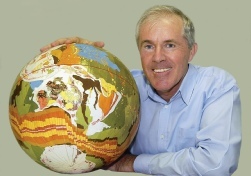 It was during my academic studies that Professor Carey of the University of Tasmania recognized the potential of my research into Expansion Tectonics. Carey then kindly“passed on his Expanding Earth baton” to me, an honour that I deeply cherish. Geology is a science comprising the study of solid Earth, the rocks of which it is composed, and the processes by which they evolve. Geology gives insight into the history of the Earth, as it provides the primary evidence for tectonics, the evolutionary history of life, and past climates.